Hey everyone! I hope you had a great weekend! I received a box of Basic Grey goodies awhile ago but finally found the time this past week to dig in and play a bit. The first collection I chose to create with was the Indie Bloom collection. 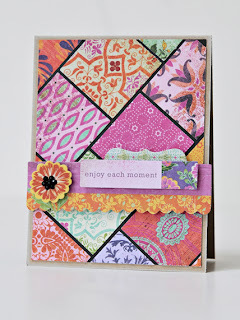 I'll be honest I was a bit scared of this collection when I first saw it - it's filled with lots of pink, purple, and flowers - three things that I are not usually found in my scrapbooking repertoire (hello?!? I have two boys! LOL). But I honestly fell in love with these papers the more and more I played with them. I love love love the pop of black against the bright colors of this collection. It lends such a rich and sophisticated feel to the papers. 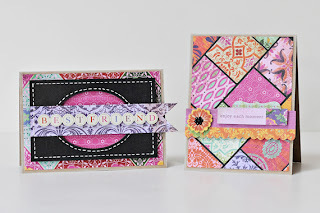 These letter stickers are actually from the Capella collection but I thought they went well with this collection and I just love that script font! This layout is about how blessed I am to be mama to my two sweet boys. I used one of the Die Cut Shapes to house my journaling and added one of the Layered Stickers to accent my writing. And just a bit more detail - another Layered Sticker with a sentiment sticker and leaves cut from the coordinating sticker sheet included in the collection pack. I also created two cards with this collection. 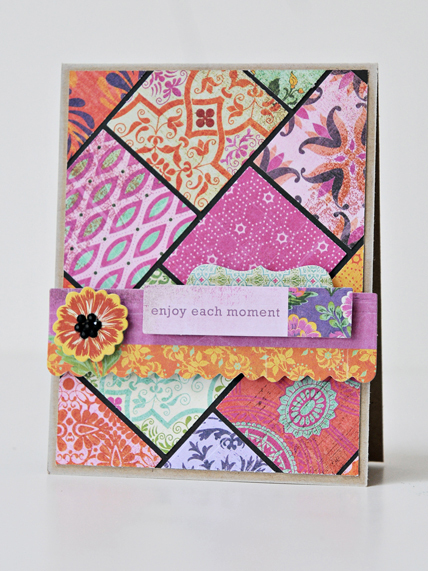 The first was inspired by one of the many designs on the patterned papers included in this collection. I simply punched several squares of paper and laid them on the diagonal on a sheet of black patterned paper. A few Die Cut Shapes for my sentiment and a flower sticker (embellished with black jewels from my stash) and voila! 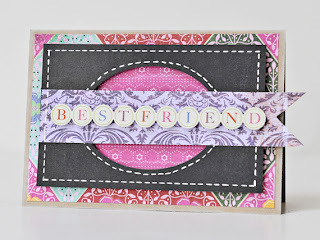 For my second card I used one of my Spellbinders dies to cut an oval shape from a piece of black patterned paper. I backed it with some pink patterned paper and adhered it with dimensional adhesive to my card front. 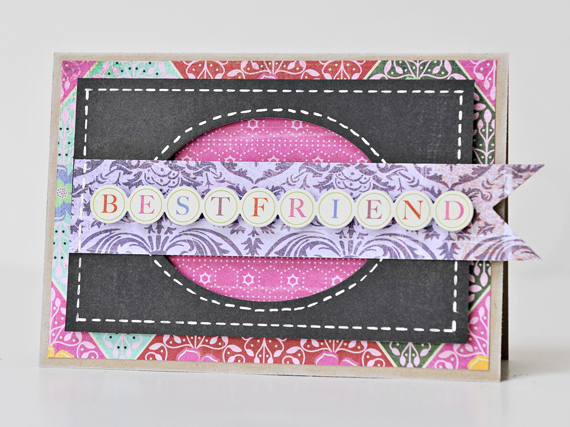 I then added the sentiment sticker to a strip of purple patterned paper and adhered that on top. Again the black really makes the colors of these papers pop! Thanks so much for stopping by!